A while ago TallGirlJ told me about this amazing vet that she had gone to. They stayed up all night together to care for one of her horses. Not only was the horse saved but, TallGirlJ was impressed with what an amazing woman this vet was. She suggested that I have her be one of our Prairie Wives and I filed it away for later. Flash forward to a hot July day this Summer. CowDog came back from walking the Cowkids home from the neighbors house. The Cowboy happened to be home and I called him out to look at her face, which was strangely swollen. He took one look at her and told me it was a Rattlesnake bite and to call the vet (our Instagram followers may recall the pictures). Our regular vet was closed so I quickly got the number of TallGirlJ’s vet. Kenzie saved our beloved and brave CowDog and then went on to take care of all of our other animals from the horses down to our newest kittens. She was the one who told us about CowScottie’s cancer this last week and will be the one to help us decided when it’s time to put her down. 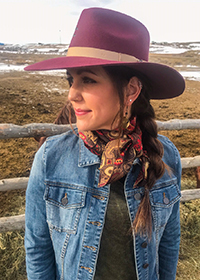 Kenzie Mares is a true Prairie Wife…Not only has she earned more badges then I can ever hope for (read on to learn about her “goat fighting badge”) but she is a true woman of grit and grace. She works from dawn until dusk helping her community and the animals that are the livelihood of many local families. She gives care to animals that have become our family, and has the strength to make what can at times be heartbreaking decisions. I cant wait to hear what you think after you read this interview! Kenzie (K): I was born in Laramie and then we moved to NE for a short time. My little brother (my only sibling) was born there. I like to tease him about not being a true Wyominite! We eventually ended up in Worland, WY where I graduated from high school. My parents (who have been married 44 years) now live on the ranch outside of Wright, WY which is actually where my mom grew up. I went to the University of Wyoming for my pre-vet classes and then Washington State University in Pullman, WA for vet school. I met my husband, Erick while on summer internship at a vet clinic in Douglas, WY. It took me 2 more years to finish vet school and we kept the road hot between WA and WY. Erick was born and raised in Douglas, so we settled there. Erik and I were married and had two daughters (now ages 9 and 7). I purchased the vet clinic in Glenrock, WY (where we now live) on November 10, 2010 after taking a short sabbatical from vet med all together. My little brother and his brand new wife live close by in Casper, WY which I love! PW: You are currently a Veterinarian and own your own practice in a small Wyoming town. What started you down this path? K: We always had a cat and then later a dog, but I really credit my love of sheep (although some would laugh that I am admitting this, including Erick) for my career in veterinary medicine. When we were kids my brother and I raised the bum lambs (orphaned lambs) for my uncle. One summer we had 13 of them, they all had names and my mother’s kitchen was sticky and full of flies from all the milk replacer we mixed up that summer. After that, I raised some market lambs and breeding ewes for 4-H. I always loved lambing. I ended up working for our local vet during high school and into college. Funny enough, I’m not really an “animal lover” as you think of it. I’m a people lover and that’s what really drew me to veterinary medicine…helping people. PW: What kind of education does it take to become a vet? K: You need 2- 3 years of undergrad to get all of the requirements. Then, you apply to vet school. Once you are accepted, it is a 4 year program. If you specialize, internships and residencies are optional after that. Organic chemistry really knocked my socks off! I had to retake it in undergrad to get a better grade so I could get into vet school. PW: Is there anything you wish you knew then that you now know? K: I wish they would tell you how demanding a career veterinary medicine is. I had no idea how hard it would be to balance my career and personal life. I don’t get to do all the “mom things” that I wish I could. Also, being a mixed animal veterinarian (especially in a small rural Wyoming town) is not as lucrative as people imagine. I was fortunate enough to get my education paid for, but most veterinarians leave school with enormous debt. ($100,000 +) I own the clinic where I work and with payments on the clinic, I make less than $60,000 a year…which probably surprises a lot of people! PW: What was your first job out of vet school like? K: I worked in Douglas for a family practice ( a dad and two sons who were vets) for 9 years after I graduated. It was a great place to learn and I still credit a lot of my little tricks to the things I picked up from them. They were good to me with scheduling, especially when the girls were little. PW: What led you to open up your own practice? K: I actually quit my job in Douglas without a clue what I was going to do next! I just knew it was time for a change. I started a small home business baking cookies, “Mares Eat Oats”. It only lasted a few months…when baking cookies wasn’t fun any more. I heard through the grapevine that the vet practice in Glenrock was for sale. It was also happenstance that I corresponded by email with an old classmate who was also looking for work. I jokingly suggested that she come to Glenrock with me. Though we started out together, it eventually ended up we had different needs that the practice couldn’t meet. So, here I am 5 years later, a solo practitioner in Glenrock, WY. I truly believe God knew that I needed her to show me the ropes. She taught me a great deal about large animal medicine, which I hadn’t done much of at my other job. Honestly, I had myself convinced that I didn’t really have what it took. She taught me that I did, and helped push me outside my comfort zone. Because of her I was able to see what I was truly capable of. PW: Time to get down to the nitty gritty are you ready? 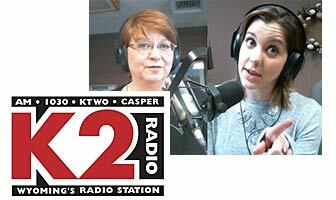 PW: As female vet in Wyoming, have you run into any biases or bad attitudes? K: Surprisingly, not really! I think most of the flak I got was because at 4’11” and 20 something I looked 10 years old. Not because I’m a woman. There were a few old codgers that tried to give me a run for my money, but eventually I won them over! PW: What is your favorite animal? K: Oooo… that’s a tough question! I like them all for different reasons. But, I enjoy dogs, horses and I still love sheep. PW: What animal challenges you the most? PW: Can you walk us through a “typical day” ? K: There is no such thing as a typical day! It’s a wild world we live in, and in rural medicine is very seasonal. There is pregnancy testing in the fall, calving in the spring, horses in spring and summer and so on. Usually, I get to the clinic about 7:30-8:00 am, get some coffee brewing and do a little paperwork before we do surgery (spays, neuters and dental surgery are most common). Then we start appointments which can be anything from vaccinations, to sick animals or lameness in horses. We have the occasional emergency like wounds and cows that need a c-section. In the fall, I often leave so early in the morning it’s still dark to drive to a ranch and check cows…and then come back home in the dark of night…only to turn around and do it all again the next day! At times like this my awesome staff is left to keep the home fires burning back at the clinic, and they do a hell of a job. I usually try to check-in when and if I have cell service. PW: I’m sure you have a ton of funny stories; can you share a few with us? K: One of my favorite stories is about a goat named “Fang”. Mara, my technician and I were giggling because my client had told us the goat’s name and suggested we wear welding gloves to examine her because she bites. I thought, ya right, a biting goat?! I got my coveralls on and we headed out to the trailer. The owner cautiously led us into the trailer so that we could look at a suspicious lump. We got our hands on “Fang” without much problem and I felt the lump, it turns out that it was an abscess full of pus. At this point “Fang” was still behaving quite well, but we needed to lance and drain the abscess. Mara had a good hold on the goat, so I went ahead…A gush of stinky yellow lumpiness oozed down Mara’s leg. Then as I tried to finish cleaning the abscess out, “Fang” lost it! She reared up and started clobbering me with her front hooves. Pus and blood were flying everywhere…it was crazy! After what happened to poor Mara and her pants, I was afraid to even look her in the eye. On the way back in the clinic, I finally asked her if we were still speaking and we both burst into uncontrollable laughter! Never did I think a sweet little goat could be vicious, but “Fang” proved me wrong that day. PW: As a vet you deal with the sometimes harsh realities of being a pet owner, and more often than not animals are family members. How do you cope with having to put pets down or deliver bad news? K: As bad as it sounds, it gets easier. I’ve learned the hard way that I’m the animal’s “voice” in these situations. It’s hard for people to do what’s fair without me shining a light on how the animal feels and explaining they have no concept of time. They don’t know today from tomorrow from next week, just how they feel right now. Euthanasia is something I pride myself on being good at. It’s a memory that lasts forever and I want it to be stress free and never traumatic for the animal or it’s family. PW: Not only do you own your own Veterinary practice but you are a wife with a husband that travels and a mother of two young girls…how do you keep your sanity? K: My staff and family will tell you that sometimes I don’t! Most importantly, we laugh every day. Someone once told me “embrace the chaos” I try to remember that. Just throw the kids in the truck with you and make it a fun adventure. I’ve come a long way in the last few years, I’m better at asking for help (though it still makes me feel guilty). We have Erick’s aunt clean our house and we call her our marriage counselor. As the saying goes, it takes a village! PW: What vet or animal myths do you hear all the time that drive you crazy? K: The myth that you should let your dog have at least one heat cycle. Their risk of the surgery increases and with each cycle your dog’s risk for mammary cancer increases. AND Ringworm is not a worm, it’s a fungus. K: Trust God and Love people. The doctor that I worked for in high school was a character! He told me that life was like a river, don’t get caught up in the everyday hustle and bustle of the rapids on the surface, anchor yourself in the steady deep quiet of the under current. Spend your time and energy on the things that have the biggest impact. No matter how busy you are, when the waiting room is full of people, you still give each appointment your full attention. Genuinely care for the people you come into contact with, don’t rush through interactions with false smiles and busy minds. The Big Book says, “ be quick to listen and slow to speak”. And always, hug your people everyday. Research says, 10-second hug a day can lead to biochemical and physiological reactions in your body that can significantly improve your health…plus it’s just the right thing to do! 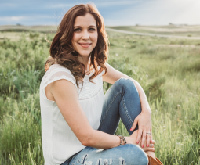 5 thoughts on "Prairie Wife of the Week: Kenzie Mares (Small and Large Animal Vet)"
I went to college with Kenzie back in the day. I love hearing about Wyoming women who stay Wyoming women, and leave their mark on this great state! Congratulations Kenzie, on a thriving practice and winning the old codgers over! Hi Teresa, I’m just now reading these comments! So sorry, thank you for the pat on the back! I’ve heard you are leaving your own mark on our great state, keep up the good work. Thank you Kenzie, you have been a great asset to this community, I’m glad when you left Douglas, you decided to came here! Have been amazed at how much you care for your clients and their owners, you put in so much time with Jil’s horse and never gave up. You took the time to let the grand babies ( and me) to see the ultrasound of a pregnant cow, you never make me feel stupid when I come in with even something minor with the dogs, For that I say Thank You! You also have a couple of pretty cute girls!